Take care of your patio as it’s a beautiful section of your home. While many homeowners are focusing on the interior of their home, many fail to realize that the patio also plays a large role in the aesthetic beauty of the home itself. It’s not only a comfortable area for you and your friends to spend a nice day out, but it promote the value of a home as well. Remember, your patio furniture is exposed to both sunlight and heavy rains. This means that they’ll need much more maintenance than the furniture that you have inside your home. So keep a close eye on the condition of your patio furniture. And, a deeper look will also reveal that you might have to replace that sagging patio cushion that’s filled with bacteria as well. There are many routes that you can take when focusing on patio foam replacement. For one, you can simply buy a new cushion and call it a day. Or, you can open up the cushion and replace the foam. Both ways work just fine. If you’re more of the DIY guy, you can look into products that absorb moisture, like an open-celled foam, and replace all of your cushions with this. 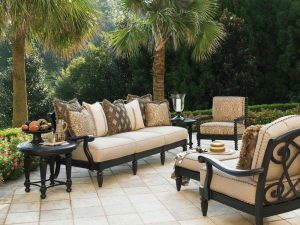 You can also purchase a custom cushion that brings a new element to your patio. These can be anything from a custom foam to upholstery that’s both pleasing to the eye and elegant. However, before you commit to a certain one, be sure that it is weather-resistant, as you don’t want to spend a fortune only to have it replaced in a few months.